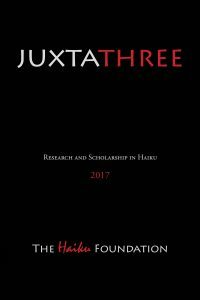 It also contains reviews of Raymond Roseliep: Man of Art Who Loved the Rose (Winchester VA: The Haiku Foundation, 2015), by Donna Bauerly, reviewed by Joshua Gage; and Issa and Being Human: Haiku Portraits of Early Modern Japan (New Orleans, LA: HaikuGuy.com, 2017), by David G. Lanoue, reviewed by Randy M. Brooks; as well as eight new haiga from a cadre of artists setting haiku by former U.S. poet laureate Billy Collins. 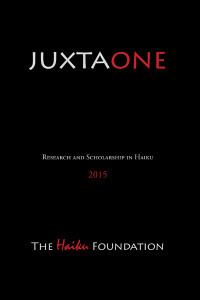 JUXTAONE, ISBN 978-0-9826951-2-8, 6″ x 9″, 274 pages in full color (Winchester VA: The Haiku Foundation, 2016). 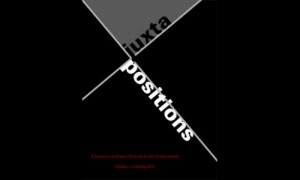 Edited by the Juxtapositions Editorial Staff: Peter McDonald (Senior Editor), Stephen Addiss, Randy Brooks, Bill Cooper, Aubrie Cox, Jim Kacian, Ce Rosenow, Dave Russo, Sandra Simpson. Includes articles by Marshall, Joy, Trumbull, Shirane, Takiguchi and Kacian; interview of Yuki Ito by Udo Wenzel; reviews by Welch and Hall; resources by Brooks; haiga by Beining, Codrescu, Makino, Moss, Mountain, Peckham and Rotella, with commentary by Addiss. JUXTATWO, ISBN 978-0-9826951-3-5, 6″ x 9″, 290 pages in full color (Winchester VA: The Haiku Foundation, 2016). Edited by the Juxtapositions Editorial Staff: Peter McDonald (Senior Editor), Stephen Addiss, Randy Brooks, Bill Cooper, Jim Kacian, Ce Rosenow, Dave Russo, Sandra Simpson. Includes articles by Simpson, Kendall, Trumbull, Marshall/Simpson; interview of van den Heuvel by Kacian; reviews by Allen, Welch and Rosenow, plus mini-reviews of poems by several poets; resources by Brooks; haiga by Moss, Babusci, Codrescu, Peckham, French, Mountain and Addiss, with commentary by Addiss and Kacian. 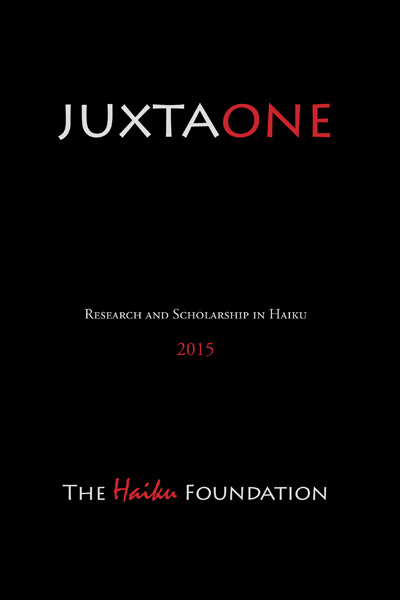 JUXTATHREE, ISBN 978-0-9826951-4-2, 6″ x 9″, 190 pages in full color (Winchester VA: The Haiku Foundation, 2016). 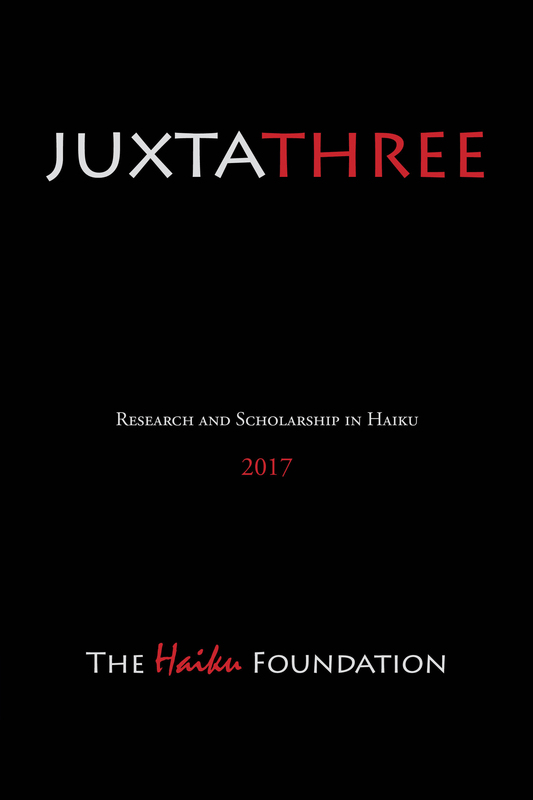 Edited by the Juxtapositions Editorial Staff: Peter McDonald (Senior Editor), Stephen Addiss, Randy Brooks, Bill Cooper, Jim Kacian, Shrikaanth Krishnamurthy, Ce Rosenow, Dave Russo. 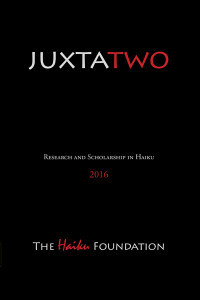 Includes articles by Pierides et al, Rosenow & Hamington, Cates, Sato, Addiss, McMurray, and Marshall; reviews by Gage and Brooks; haiga by Addiss, Babusci, Beining, French, Makino, Moss, Peckham and Rozmus, setting haiku of Billy Collins. Congratulations to all. Juxtapositions is also cited on the Education Resources page, for those searching for content in the Higher Education category. I have not achieved this kind of writing with poetry so far, though wrote in an academic style in special education (retired now).